This year’s awards are open for business - get your nominations now! 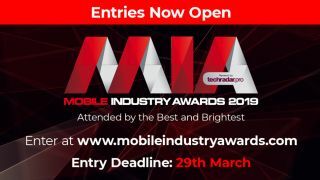 Entries for the Mobile Industry Awards 2019, powered by TechRadar Pro, are open now. 20 categories for this year's awards can now be entered, covering all areas of the industry, across Distribution, B2B, Networks, Companies, People & Teams. Now celebrating its 17th year, the Mobile Industry Awards 2019 looks to showcase the gold standard of excellence in the industry - from the boardroom to the grassroots. The 2019 Mobile Power 50 is the definitive list of the most influential figures in the UK mobile industry during the past year. The list is compiled after in-depth interviews with key senior figures across the industry, from operators and retailers, to manufacturers and distributors - but we also want to hear from you. We are searching for individuals who have influence beyond their existing roles, in addition to imbuing their businesses with unique values, and those who we feel serve as an inspiration to the rest of the trade. Please join the debate on the Mobile Power 50 website, where you can nominate somebody who you feel serves as an inspiration to the rest of the trade.